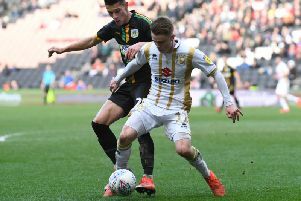 MK Dons' fringe players need to be better prepared to first team action, according to manager Paul Tisdale, after his side were knocked out of the Checkatrade Trophy on Tuesday night. The 3-2 defeat to Brighton U21s saw Tisdale made seven chances to the side which started against Grimsby at the weekend, but felt his side tired significantly during the second half, allowing the Seagulls to twice come from behind to eventually claim the win. Speaking afterwards, Tisdale said the players on the fringes of the first team need to be better prepared to step into the first team. He said: "We have to build a squad who is robust and players who can come in at a drop of a hat and perform and that's the next challenge for me. "I think we tired dismally through the second half. Lots of what we saw today I'm not surprised about. We had some intensity at the start and we looked lively for the first quarter. We had four players who play regularly in the side, but Joe Walsh went off injured. "The others have been on the periphery for a long time, and it was probably a sign of a lack of football really. We have to be careful not to be too disappointed by it – but it really felt disappointing in the second half. But I've been here before and I know the grand picture of what we're working on. "As much as I don't like losing, especially when it feels lacklustre like it did in the second half. But the reality is there were players out there who were desperate for 90 minutes and who had not played enough football, and they tired considerably. This is a reminder to them, and to us, that we have to keep the supporting group on their toes and ready. We lost our rhythm and we unravelled a bit. "Well done to Brighton – they did the opposite to us. It's disappointing but I don't want to be too miserable. We turn our attention to Saturday."